Last month I had received this request to try &amp; review Hudson Canola Oil. I had never heard about it before I had seen the mail but before accepting the offer I wanted to know something about it. So I &amp; Hubby searched around and like every dutiful Indian we also tried digging out the Hindi Name for it. Before you ask why were we searching so much let me tell you. Our family is a little finicky in these things and we (excluding me) are able to judge the difference in taste very quickly. So if the Oil would have been something strange getting a sample would have been more of a headache! Hudson Canola is a standard edible vegetable grade oil, a light oil with neutral taste and flavour. Hudson Canola can be used for all types, methods and varieties of Indian cooking: frying, roasting or grilling. Canola is neutral in flavour and aroma with no distinctive taste or smell. Canola Oil is extruded from the seeds of the yellow Canola flower. Canola Oil has the lowest saturated fat amongst all oils, very high monounsaturated fat, very high Omega-3 and rich Vitamin-E content. Canola is the best oil in terms of fat content, when looked at in totality: lowest saturated fat, very high MUFA, very high Omega-3, best balancing ratio of Omega-6 to Omega-3, zero trans fats. No other oil offers this unique combination of fats! Since we didn't find anything incrementing against the oil we decided to accept the reques. When we received it there were varied reactions but the most predominant one was "how will it taste". My Hubby was like "use it in your daily cooking and don't tell that you have used it that ways there would be no adverse reaction and we would also know that if it taste's like the oil we use daily". So, I very slyly started using it daily and guess what? The whole bottle is finished and nobody knew also. I made my daily food i.e. bhindi, badi ki subji, Paratha's, Poha &amp; most importantly even baked a cake with it and there was no difference in the taste. As far as the benefits is concerned I don't think we had any side effects so I would trust what they say on their website. Here I will share the recipe of my Eggless Fruit &amp; Nut Cake made with Hudson Canola Oil. This cake was baked on Saturday when the brat saw a cake in a shop and asked for one. I promised that I will bake it for him and I had to because he remembered my promise. Chop the nuts, figs, dates &amp; cherries into small pieces. Powder the Sugar along with the spices. 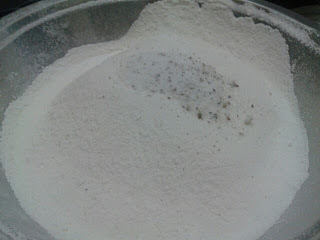 Now sieve the flour, baking soda, salt, powdered sugar, corn flour and baking powder into it. 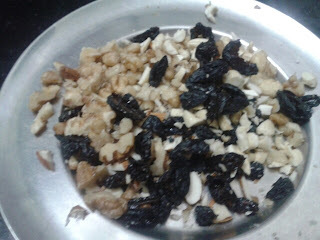 Also add powdered spices and mix well; add chopped nuts, dry fruits and mix well. 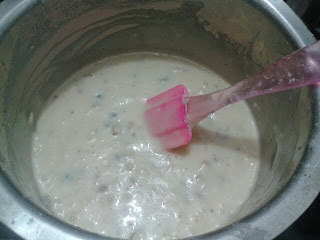 Now beat the Hudson Canola Oil in slightly warm milk till light, now slowly add the flour to it. You should first take just 1 cup of milk and if you feel that the mix is a little too thick add a little water but if you ask me 1 cup is sufficient. As is the batter should be on a little thick. 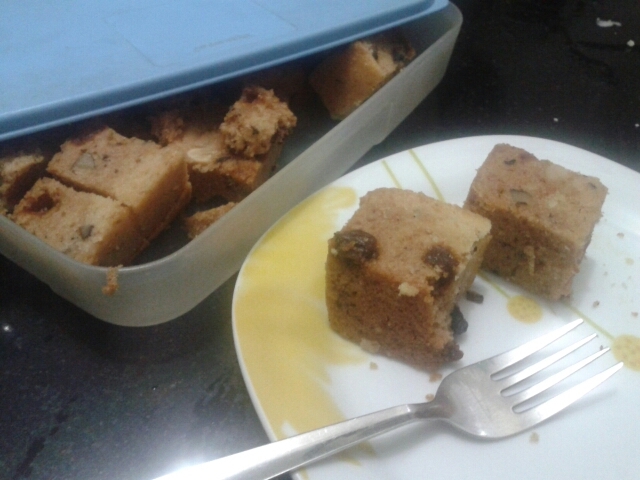 Grease a cake tin; spread some dry fruits in the bottom; put the cake-mix. Bake it at 180°C for 60 minutes. 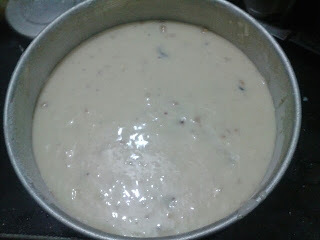 Check the readiness by inserting a knife in the center, if it comes clean the cake is ready. So do try the oil! It is good!!! That's a yummy fruit & nut cake !! It looks yummm! I'm definitely going to try it this weekend. New concept for my holiday recipe.So delectable fruit and nut cake recipe it is!